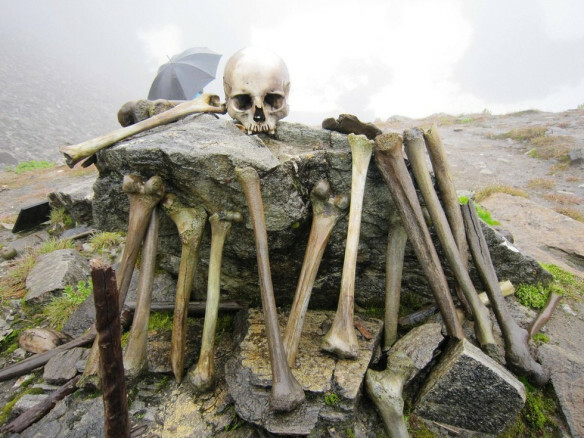 In 1942 a British patrol in Roopkund, India made a shocking discovery. 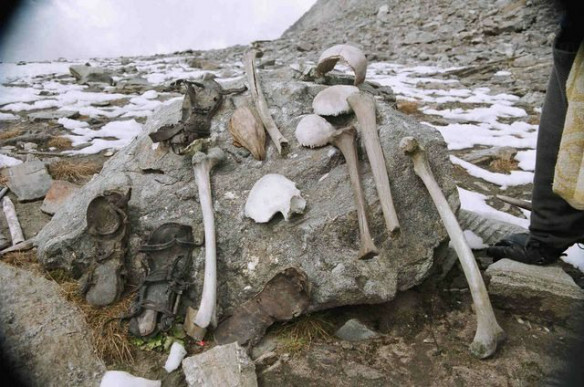 Approximately 17,000 feet above sea level, at the bottom of a small valley, was a frozen lake full of human skeletons. That summer, the ice melted to reveal even more skeletal remains, floating in the water and lying haphazardly around the lake’s edges. Had something horrible had happened here? 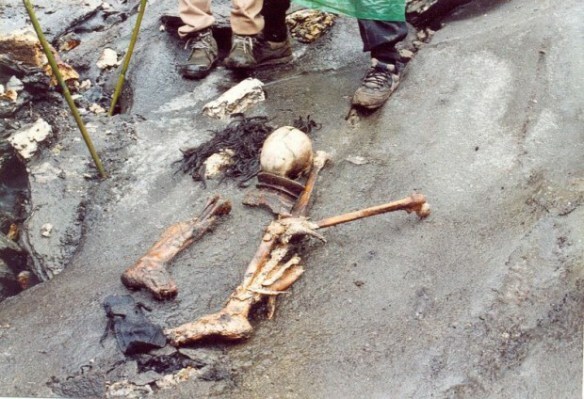 Scientists now believe they have finally solved the mystery of how and why the skeletons of over 200 people were found in a frozen lake in northern India. Lake Roopkund is located in northern India along the border of Nepal at 4,800 meters (~16,000 ft) above sea level with edges covered in snow for most of the year. The water is rather shallow, only reaching a maximum depth of 2 meters, and frozen most of the year. The frozen climate at this altitude has aided significantly in the preservation of hair, soft tissue, and leather clothing, prompting the everyone to believe these were recent deaths. These skeletons were initially thought to be the bodies of Japanese soldiers who had died of exposure while travelling through India as part of a World War II invasion. More recent analyses conclude the remains were much older than anyone expected, dating them to approximately 850AD. The significant amounts of soft tissue present first confused everyone. How could these skeletons be old if there was still flesh on the bones? Who were these people? DNA evidence of the remains indicates there were two distinct groups – (1) a closely related or family group, and (2) a shorter group of local people, likely hired as porters and guides. Many artifacts (spears, leather shoes, rings, etc.) were found among remains, leading experts to conclude the family group was most likely made up of pilgrims heading through the valley with the help of the locals as guides. What happened to them? It was initially proposed these people died as a result of exposure, perhaps trapped in an avalanche. But closer inspection of the bones reveals evidence of perimortem trauma on many of the skeletons. This is trauma that occurred at the time of death. Scientists apparently discovered a surprising pattern, in which the skulls and mostly bones of the upper body were inflicted with a similar type of trauma. Were they murdered? According to experts, the skeletons only showed signs of one type of perimortem wound. Furthermore, they did not have typical wounds indicative of the time period’s weaponry. Instead, experts determined the injuries were indicative of an impact from a large, rounded object. Remains showcased on a boulder along with artifacts–personal belongings such as leather shoes. A 2004 expedition to the lake revealed a new and unexpected scenario that could have led to the death of over 200 people. The prevalence of head and shoulder injuries led experts to wonder if their deaths were the result of something falling from above. Taking skeletal evidence and the cold environment into consideration, it is now proposed injuries were due to a sudden and severe hailstorm in which people were pelted with large hailstones (estimated 23 cm/9” diameter). Trapped in a valley with no shelter, there would have been no easy escape, thus resulting in this mysterious mass of skeletons. Their bodies remained hidden in the glacial valley, freezing and thawing for the next 1,200 years until their gruesome discovery. 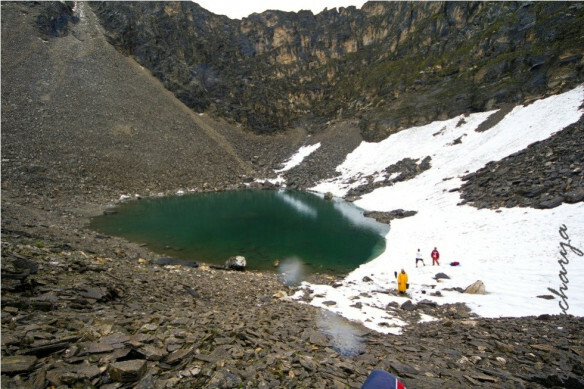 A typical view of Lake Roopkund, with remains trapped under ice and snow. Is this event really possible? It’s difficult to assess this traumatic scenario without seeing images of the vaguely described skeletal trauma. But a quick web search of hailstones reveals they can indeed reach sizes of 9 inches that experts proposed. 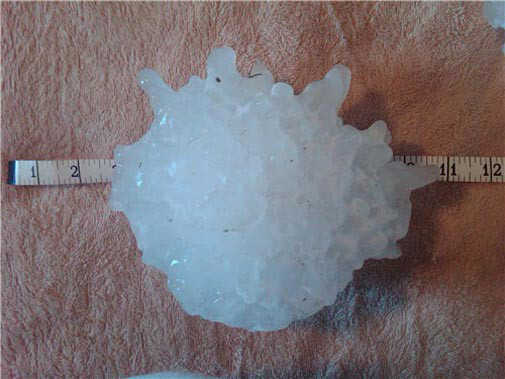 The largest hailstone collected in the US measured 8 inches across and weighed in at almost 2 pounds. Despite some extreme sizes of hailstones, only 3 individuals have died in the US (in 3 separate storms). Here is the largest official hailstone ever collected in the US. This 8-inch specimen fell in Vivian, South Dakota on July 23, 2010. Historical records indicate that the deadliest hailstorm occurred on April 30, 1888 in the northern districts of India, killing 230 people. The hailstones were reportedly as big as oranges, accumulating up to 2 feet high. Although rare, it appears these freak hailstorms with monstrous hailstones have a history of forming in the Deccan Plateau of India and in Bangladesh. Recently around January 31, 2013, a severe 20-minute hailstorm suddenly struck several villages in the state of Andhra Pradesh in southern India, killing 9 people. The short duration of storms may account for a minimal amount of trauma to the lower body. The deaths at Rookpund Lake could very likely be the result of a freak hailstorm. Although they are quite rare, history indicates these hailstorms do have a higher occurrence in that particular area and have been known to produce small boulder-sized hailstones. Taking all of the evidence into consideration, it seems probable that a very short but intense hailstorm would have led to the death of ~200 individuals in 850AD, thus solving this curious mystery.